Two compartments and a laptop sleeve: how cool is that? 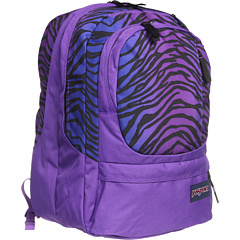 Don’t let the Air Cure in fun Zebra print by JanSport® intimidate you; it’s going to be the best friend you always wanted. Now you’ve got someone to carry all your stuff. Yoke style AirFlex™ shoulder straps. AirFlex is an ergonomic perforated EVA for lightweight and breathable support. Two spacious main compartments for versatile storage options. Padded sleeve in main compartment for laptops up to 15″. Front pocket features an organizing panel for your essentials. Cord management pocket helps keep your belongings tangle free. Quick access pocket in the loft for small accessories. Completely padded back panel for added cushioning and support. Side mesh pocket for water bottles and additional storage. Capacity: 2200 cu in / 36 L.
Laptop sleeve dimensions: 12.5 x 11 x 1.5 in. Materials: 600D polyester and 420D velocity nylon.